If you’ve been following me on Instagram you know I’ve been traveling [again] I’m currently in Paris, but this airport outfit is from my trip to London, England with the L’Oreal Paris team! I wore this on my trip from LA to London. 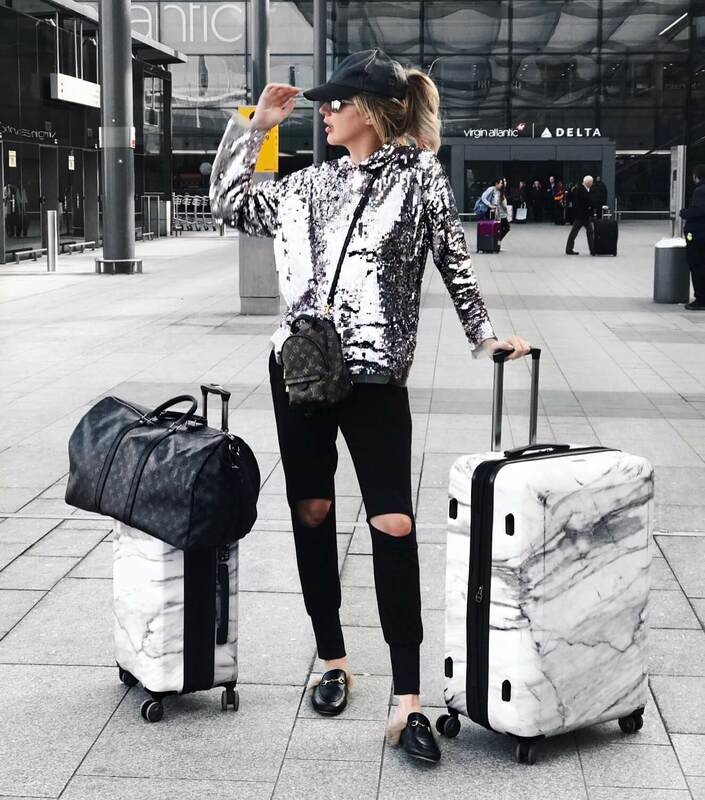 I love being comfortable but when I found this sequin hoodie, I knew that I would be able to add my love of sparkles to my travel wardrobe! Also I’ve been loving these Gucci slippers, they’re so easy to slip on/off at airport security! The perfect travel shoe in my opinion. It’s definitely a splurge item, but for the amount that I travel for work I decided it was a good investment and treat for myself. I’ve been seeing those slippers everywhere! They’re so easy to pair with so many outfits! Carlyyyyyy, I hope you are taking so many hours of video cause I miss u.
I’m obsessed with your luggage! I got the Calpak marble carry-on because you love it so much! I’ve been loving it because it expands and you can bring so much with you!! Girl, you need TSA precheck if you are still taking your shoes off at security. Loving those shoes! Being able to pair cute outfits for flights is a must. You’ve got it down pat.